When it rains, it pours in Southern California. 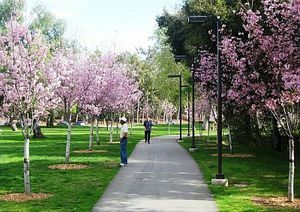 And the deluge on March 17 forced Schabarum Park to cancel the big Cherry Blossom Festival. Read more in Rich Irwin’s story CHERRY. A Safe Communities Festival will be held at Rowland Heights Park on Saturday from 10 a.m. – 2 p.m. Come celebrate our safe, secure and peaceful community! The festival will feature more than 30 health and information booths, entertainment, food and game booths. There will also be public safety displays and demonstrations by community, school and public service groups. Music by Rowland Elementary Band begins at 10:15 a.m., with the opening ceremony at 11 a.m. Door prizes will be offered by the LA County Parks and Recreation Department. Live entertainment runs from 11:30 a.m. – 2 p.m. featuring: Karen’s Kids, Tiny Tots, Tai Chi Program, Hula Dance, Wrestling and martial arts. A Jaws of Life demonstration will be done by the LA County Fire Department at noon. The fesitval is sponsored by LA County Supervisor Don Knabe’s Office, LA County Sheriff’s Department, County Parks and Recreation, California Highway Patrol and Operation Safe Community and Rowland Unified. The Diamond Bar City Council is expected to approve the environmental documents tonight that would allow the construction of a dog park. The 1.35-acre dog park would be built within the existing Pantera Park, 738 Pantera Dr. It would have a run for large dogs and a run for small dogs. It would be part of Pantera Park, a popular city park with basketball courts and tennis courts. The City Council report says there will be no significant impact to the environment from the new dog park. It would be the first-ever dog park in the city. The City Council meets at 6:30 p.m. in the government auditorium of the South Coast Air Quality Management District building, at 21865 Copley Drive. An “Illuminating Minds” art exhibition will showcase the college-level artistic talents of 14 Nogales High School art and film students at the Puente Hills Mall. The one-person shows begin with an opening reception scheduled from 5 to 8 p.m. Saturday March 24 on the upper level next to Sears. A full runway fashion show by avant-garde designer student Jose Perez will take place at 6:30 p.m. The exhibition will run through April 20. Animal control officers are investigating allegations that a 16-year-old Wilson High School student killed three kittens with a baseball bat. Officials responded to the animal cruelty complaint after a Wilson High School employee reported the incident. Almost a year after a devastating arson fire destroyed the main sanctuary, St. John Vianney Catholic Church has reached an agreement with its insurance company. While the church would not disclose the amount of the settlement, church leaders are pleased because they said it enables them to move forward with erecting both a $600,000 temporary structure and a permanent replacement sanctuary. “This is the best news. It has been 11 months since the fire, and we have struggled. 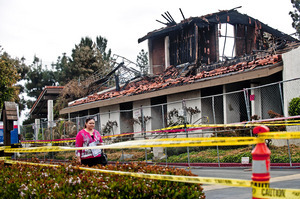 We’re tired of looking at the burned-out church building,” said the Rev. Tim Nichols, pastor of the church. Nichols said demolition will start in about two weeks, immediately followed by the setting up of a large, temporary building that will hold 750 people, he said. The temporary church won’t be completed until June or early July, he said. Read more in Steve Scauzillo’s story CHURCH. The Rowland Heights Community Coordinating Council will meet 7 p.m. Friday, March 16, Pathfinder Park. The speakers will be State Assemblyman Curt Hagman and Commander Michael Rothans from the Los Angeles County Sheriff’s Department. The topic will be the transfer of state prisoners to local jurisdictions and its impact on local communities. 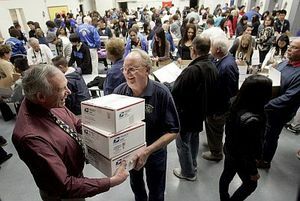 Area Kiwanis clubs gathered March 8 to assemble care packages for 200 sailors in Afghanistan. More than 100 people packed Williams Elementary’s cafeteria to thank the men and women serving overseas. A committee brainstormed items to send and came up with a list of 36 things. The 12 local clubs include Hacienda Heights, La Puente/City of Industry and Walnut Valley. Each collected three items for the packages, according to co-chair Rona Lunde. While the boxes were sent to deployed Marines in Iraq last year, the Hacienda Heights club member said the division chose to pay tribute to the Navy this year. Read more in Melissa Masatani’s story KIWANIS. A Hacienda Heights man was sentenced to 12 years in prison for stabbing to death a fellow guest during an argument at a party, officials said March 8. Deputy District Attorney Christopher Stogel said Mannie Juarez, 24, was sentenced Wednesday at Pomona Superior Court. He said a jury convicted Juarez on Feb. 10 of voluntary manslaughter. The jurors also found true the allegation that he used a knife to kill 22-year-old Eduardo Vargas of Hacienda Heights on Aug. 7, 2011. Both men attended a party held at a house in the 16100 block of Garo Street that night. Stogel said Vargas was hit by a woman who lived at the house. He added that the attack was unprovoked and the woman was drunk. Juarez, who was a friend of the woman, stepped in and got into a fight with Vargas. He stabbed Vargas once in the chest, severing an artery. The wounded man collapsed in a neighbor’s driveway. He was taken to a hospital where he died. Witnesses chased Juarez and detained him until deputies arrived. Everyone knows that exercise helps your heart, so Southlands Christian School has taken it a step further. 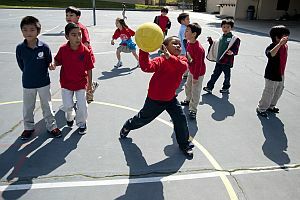 The Rowland Heights campus has been promoting the American Heart Association’s Heart Health Month. The monthlong campaign ended with everyone wearing red on Feb. 29. Southlands Christian was awash in a sea of red at its campus on Brea Canyon Cutoff Road. Duncan said 415 people rose to the challenge. Read more in Rich Irwin’s story HEART.